Dindigul Chicken Biriyani, the famous south Indian style Chicken Biryani with subtle flavors of mint leaves and garam masala. We are biryani lovers and biryani is my weakness 🙂 I have tried “n” number of restaurants for the authentic biryani taste or which can satisfy my taste-bud. Some of them would be too spicy or taste like tomato rice in the name of biryani or more dalda / ghee would be added. My first foremost love would be for Muslim Style Biryani. Next comes Ambur Biryani and Dindigul Biryani & also Selvi Mess Biryani in Salem. But nothing can satisfy when its about homemade Biryani. In course of time, we have developed liking for biryani prepared at home let it be veg or non-veg. 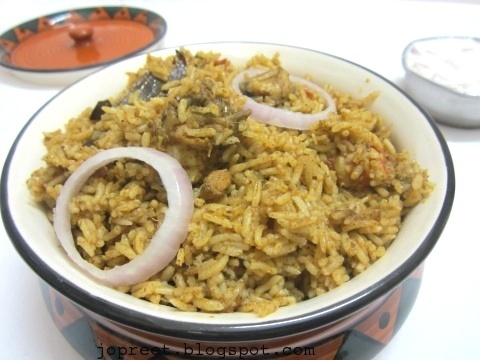 This biryani recipe is close to my heart which never fails me. Do try the recipe and impress your family. I photographed this recipe for Ancient Cookware. This copper rice server can be used to serve biryani, pulao or any variety rice dishes. Those who wish to buy products from Ancient Cookware, let it be indian pots or any products from their store, can avail a discount of 5 % by using coupon code : Preeti. You need to use this code at the time of checkout. Some of the other biryani recipes shared in my blog, Ambur Chicken Biriyani, Mumbai Style Chicken Biryani, Hyderabadi Chicken Dum Biriyani, Zafrani Chicken Biriyani, Mutton & Curry Leaves Biryani, Crab Biriyani & Mutton Keema Dum Biryani. If you try any of my recipes, do share your feedback with us. the famous south Indian style Chicken Biryani with subtle flavors of mint leaves and garam masala. Marinate chicken with turmeric powder, curd, lemon juice and salt. Keep it aside for 30 mins. To prepare masala paste, grind ginger-garlic paste, green chilies, mint, coriander leaves and onion without adding water. Keep it aside. Wash the rice and drain the water completely. Heat 3 tbsp oil in a pan or Handi. Add 1 tbsp ghee, cloves, cinnamon, star anise and bay leaf. Saute a while. Add mint leaves and chopped coriander. Cook for few mins. Add marinated chicken to it and cook for 5 mins. Now, add chopped tomatoes and cook for another 2 mins. Add red chili powder, garam masala and ground masala paste. Cook for 5 mins. Add left over curd from marinated chicken and cook till the oil separates. Add 4 cup water and allow to boil. Now, add soaked rice and salt to taste. Mix well and close the lid. Cook till rice is cooked. Gently stir the rice to mix with gravy uniformly. Serve hot with onion raita. Lavish and mouthwatering Dindigul Biriyani. Never tried this method. Loved the way you have prepared it. Love all south style biryani. My friend has given me a similar recipe. I need to try this cooker style one. Thanks for leaving comments in my blog ..:) i am vegetarian but your Biryani colors looks tempting . Has the look of a nice homemade biryani! I love biryani and have never attemped to cook it. However, with your recipe, I think I can manage! This looks so exotic and full of flavors!! Inviting myself to ur place, irresistible briyani. Tried the Biryani my husband and friends loved it .